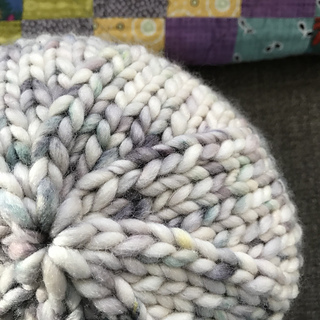 Confection is a fluffy, cozy hat with a big brim to keep your ears extra-warm. You’ll need just one skein of Spirit Trail Fiberworks’ new yarn Zaftig, size US 13 needles, a stitch marker, and a tapestry needle. Check your gauge to ensure that you’ll have enough yarn. 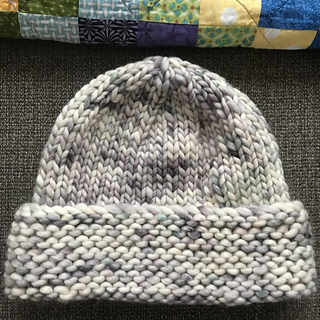 The sample here used almost all of the 90-yard skein. Finished Measurements – about 19 inches unstretched circumference and 8-1⁄2 inches deep with brim folded up. Confection, and all my patterns, are copyright Jane Cochran, so PLEASE DO NOT COPY, SHARE, OR RESELL IT. I hope you enjoy it! If you have any questions please contact me at notplainjane@gmail.com.